“Cut in 2 seconds!” Is the Ottolock really that easy to snip? 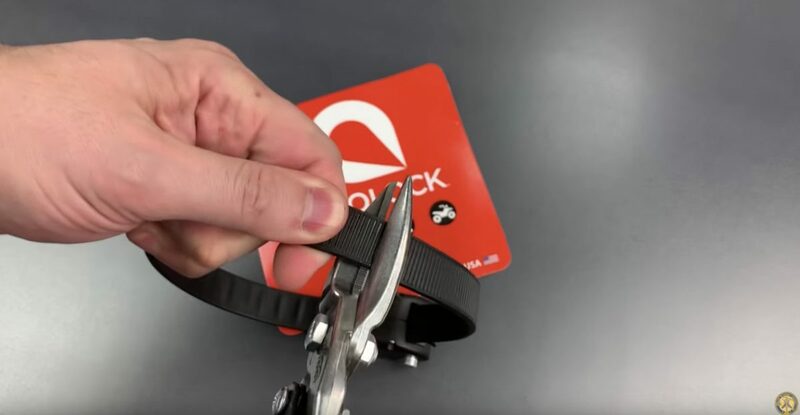 Screen shot of LockPickingLawyer video. Watch it below. On Friday evening we learned what great lengths the Portland Police Bureau will go to retrieve a bicycle. It happened around 6:00 pm in northeast Portland when someone reported that a child’s bike had been taken from the front lawn of a house on the 5500 hundred block of NE Simpson Street. 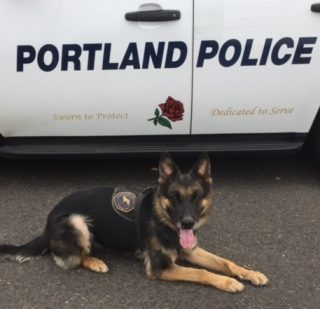 Arriving officers obtained the subject description and learned from the family members that the subject might have boarded a TriMet bus with the stolen bike. Officers were able to locate the correct bus. Officers observed a child’s blue bike matching the victim description, mounted on the bus bike rack. Officers flagged down the bus driver, who confirmed that a male subject matching the suspect’s description was inside the bus. 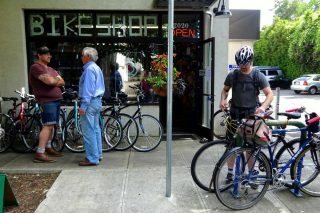 Be on the lookout: Breadwinner Cycles in north Portland was broken into last night and the thieves stole two bikes. Co-owner Ira Ryan contacted us with the news this morning. He said someone smashed through their glass front door, waltzed into the shop and took the bikes and a company laptop. Breadwinner, the bike company formerly based out of Ryan’s garage, opened in this new location and expanded into a cafe last winter. Ryan says the cafe and shop will be open for business today once all the broken glass is cleaned up. “We are bummed, but determined to carry on of course,” Ryan said via text this morning. 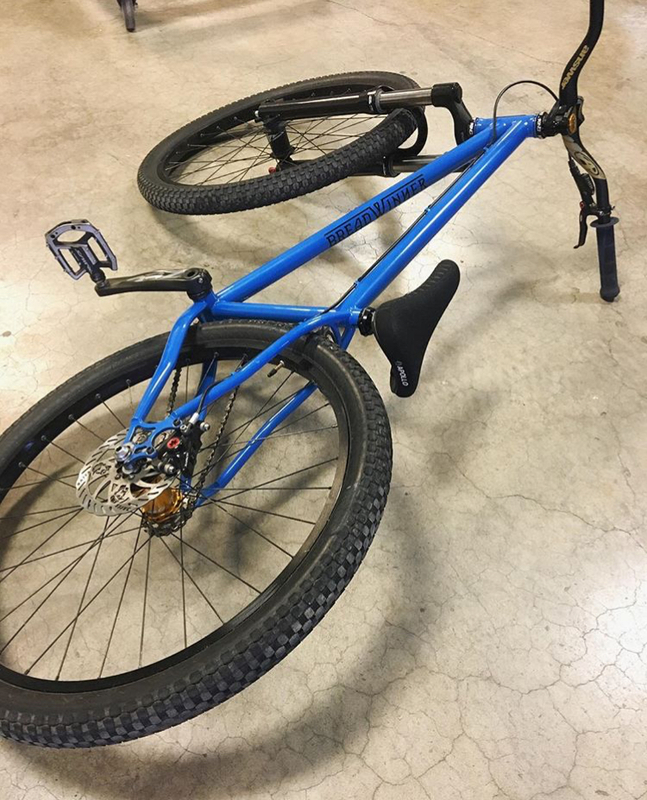 If you see either of these bikes, please contact Portland Police non-emergency line at (503) 823-3333 and/or drop us a line and we can put you in touch with Breadwinner. Metropolis on N Williams and Page. 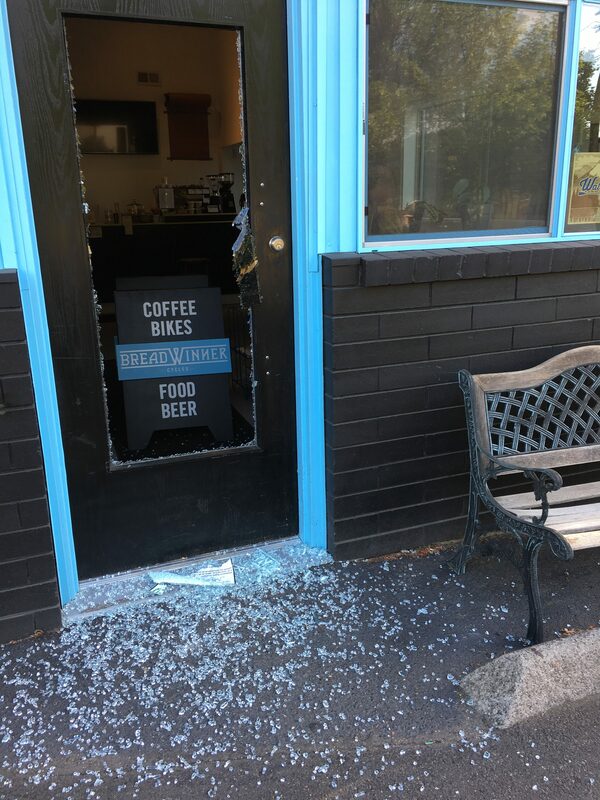 Metropolis Cycle Repair owner Nathan Roll says thieves broke into his shop last night and took three mountain bikes — two of which belonged to customers. UPDATE: Roll says he just realized thieves took an additional bike — his own. See description and photo below. Here’s more from Roll about how it happened along with a description of the bikes. The thieves broke a pane in a window in the back of the shop and were able to unlatch the window. This situation will be remedied shortly. Interestingly, they were only interested in mountain bikes. They passed over numerous other bikes to select these 3. They also took a small amount of merchandise, including an Ortlieb backpack and a couple of sets of lights. Here are pics of the 3 bikes. 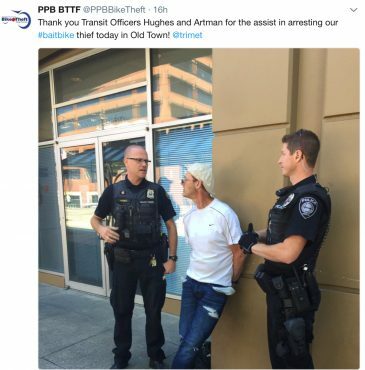 A post on the PPB Bike Theft Task Force Twitter account yesterday. A new program being run by the Portland Police Bureau Bike Theft Task Force is showing early returns. Yesterday in Old Town a man was arrested after stealing a bicycle that was equipped with a tracking device. The bike is just one in a growing fleet of bait bikes being deployed by the Task Force. It’s all part of the PPB’s ongoing effort to discourage bike theft. As GPS devices have improved and become more accessible in recent years, the technology is finally becoming more common with law enforcement agencies. As we reported in 2015, the Clackamas County Sheriff’s Office arrested thieves who nabbed a bait bike from Reed College. And just last week the Washington County Sheriff’s Office was featured in a KGW-TV news story about their bait bike program. Officer David Sanders leads the PPB Bike Theft Task Force unit. For him, using bait bikes is an important step to keep up with thieves — some of whom are now taking the unusual step of modifying serial numbers to avoid being tracked down. Section of the Springwater where the incident occurred. 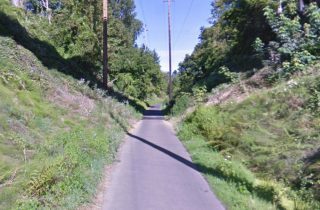 While riding on the Springwater Corridor path in the early morning of May 10th, someone knocked Portland resident Vincent Rodarte off his bike. The impact caused him to lose consciousness. When he woke up, his custom-built mountain bike was gone. 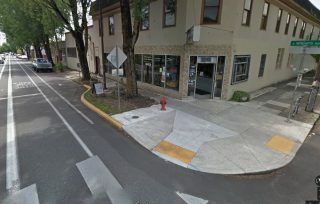 “The details on that still elude me,” Rodarte wrote on the Oregon Bicycle Racing Association email list where he first reported the incident. It happened between 12:30 and 3:00 am at the intersection where the Springwater passes SE Tacoma and 32nd streets (map). 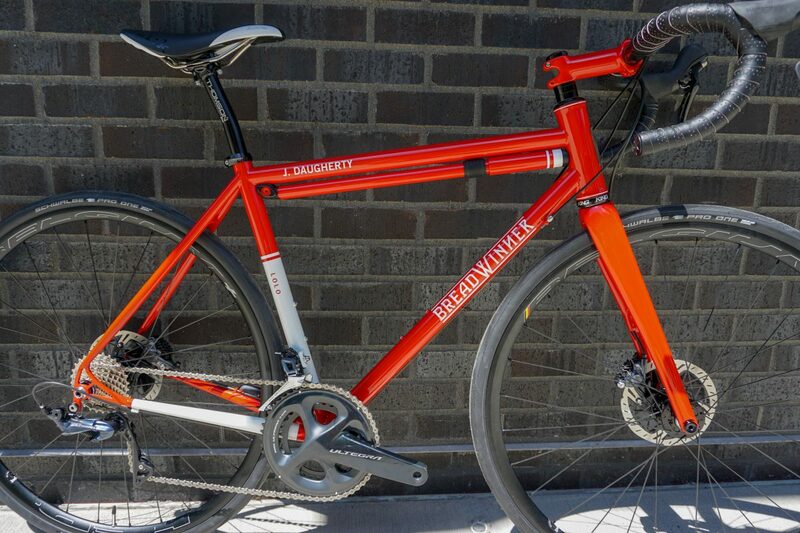 Rodarte is appealing to the community to look out for his bike in hopes that it can be recovered. 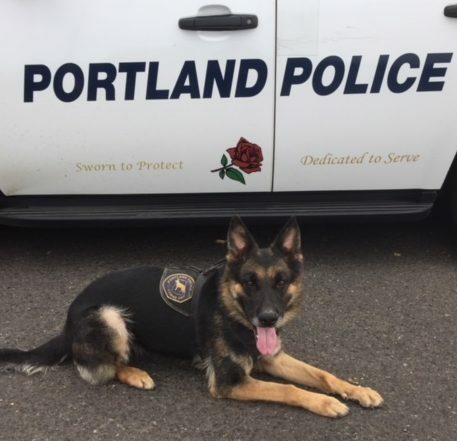 He’s filed a police report and has been in contact with a with PPB Bike Theft Task Force member who has already begun searching the area. Rodarte got a tip that his bike was spotted under I-405 and NW 19th, but so far police haven’t been able to get it back. The first of a new generation — and hopefully a new era of bike theft prevention. 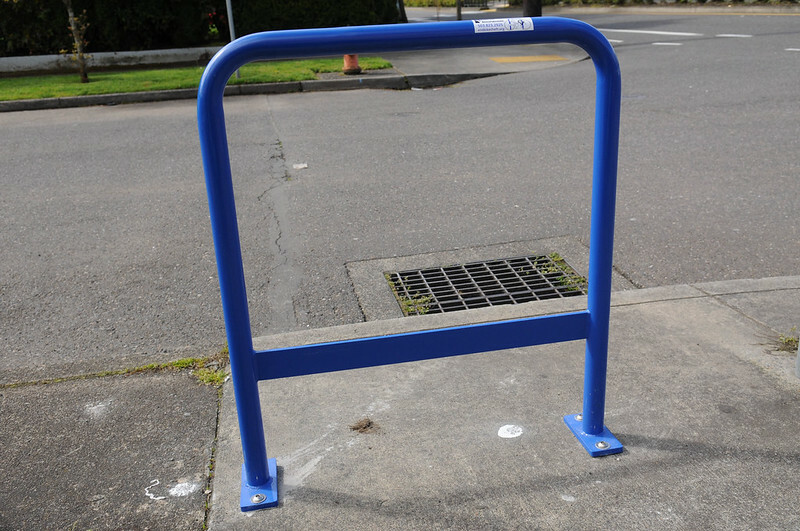 The City of Portland just raised their game when it comes to providing people with a secure place to park a bicycle. The shop is in the process of moving to a larger location. Kenton Cycle Repair has had a very rough start to the week. Around 6:00 am Monday morning two men broke into the shop and stole nine bikes and a large amount of new inventory off the shelves. The shop is located at 2020 N McClellan Street, just off Denver Avenue in downtown Kenton. According to @pdxalerts (not official) the suspects were driving a blue Chevrolet pickup. Walker said the thieves busted out the front door. When he arrived around 8:15 there was glass all over the floor. A witness from the Kenton Hotel Apartments across the street saw two men in a truck loaded with bikes and called 911; but they drove away before police arrived. The witness was able to share a description of the men and a partial license plate number. Size is just one reason this product has potential. BikePortland subscriber and resident bike theft expert Bryan Hance from The Bike Index checked out the Iota Tracker with an eye towards bike tracking, DIY hacking, and more. We field a lot of questions about ‘bike trackers’ at the Bike Index – everybody wants a small, affordable GPS tracker for their bike. Sounds like a simple request; but many people are surprised to learn a product like this doesn’t exist yet. Size/hideability — It is hard to disguise a tracker so thieves can’t instantly find it. And having something that uses several antennas (GPS and cellular) means they aren’t easily hidden – nor are they very small. 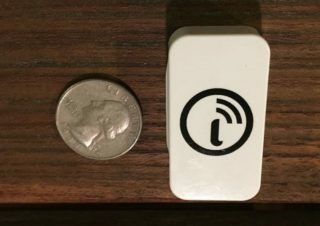 Reliance on cellular — Most trackers use the cellular network to report their location, which means most trackers are 50% cell phone parts – and means paying for cell data, supporting a SIM card, having a hefty battery, etc. This post is by Portlander Bryan Hance. 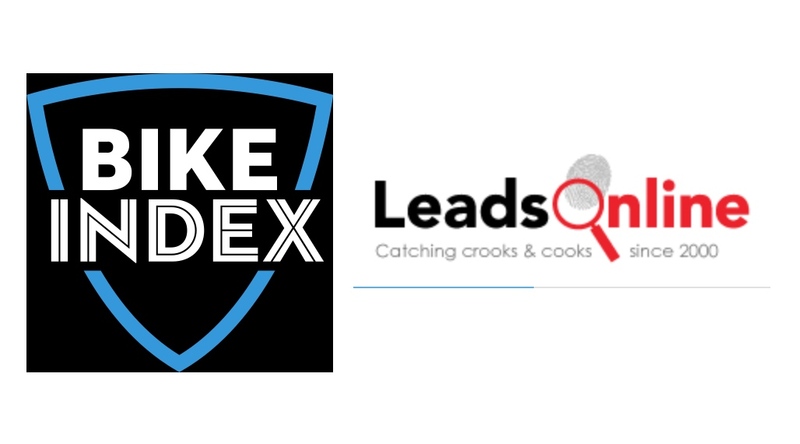 Bike Index is very excited to announce a new partner in our fight against bike theft: LeadsOnline.com! LeadsOnline runs the nation’s largest online investigation system used by thousands of law enforcement officers to monitor pawn shop and secondhand retailer transactions. Pawn shops across the country report their transactions to LeadsOnline in order to comply with local laws – and police use the site’s tools to search for, identify, and recover stolen goods from their own local police reports.